I am moving aboard these days and have a lot of stuff coming on and off the boat. Does anyone use their boom to lift things up and down the companionway or on and off the dock? If so, what is your configuration? 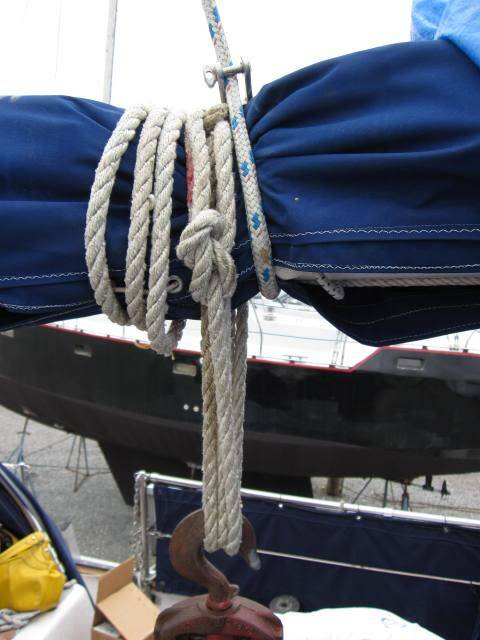 Does anyone run a halyard through the end of their boom somehow? Just curious. Re: Using your boom as a boom. That's what we used to get the 4 old 8D batteries out of the boat when I re batteried the boat. Wasn't about to hump 140 lb batteries up the companionway by hand. I have lifted engines out of boats with a boom many times. I usually rig a sling over the companionway. The lone/sling takes off the pressure on the center of the boom. Ive used it to lift a Yanmar diesel from the back of the pickup truck into the boat,ran the halyard to the boom where i had a strop around it with a strap winch for lowering the engine into the boat,worked great. The boat was on the hard at the time. I am reading all of your words but having a hard time understanding what it all means. Can someone draw me a picture of a standard hoisting set up? How does one run a line through the end of the boom? 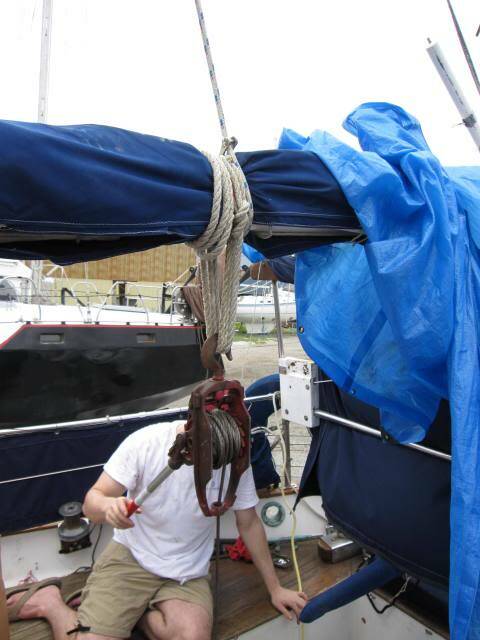 Attach main halyard to end of boom, also, attach some rope to end of boom. place strap around boom to attach come-along, block & tackle, whatever. swing boom out-board. attach & hoist item(s). pull rope that is attached to end of boom toward midships, use winch for rope, if necessary. lower item(s). done. You could also rig up a whisker/spinaker pole to act like a crane on the foredeck, but if you don't know how to rig it properly, you could suffer damage and/or injury. we brought my old dead red engine out of the main saloon via center overhead hatch using my boom and a lifting rig. worked great. Hey man my boom only has two o's in it. You must have a really nice boat. The topping lift to control the boom and the main sheet to control the cargo. Seen people taking out their engines like this. If you're going to lift something very heavy I suggest beefing up the support for the middle and end of the boom. We have a boom gallows so the end was pretty well covered. When swinging out though you'd better make sure your topping lift is pretty stout. You can see we have around 350-400 lbs on the boom here. The main halyard was secured to the boom and winched tight against the load of the engine at the point of stress. 2) use a plastic cable-tie (or tie-wrap) to "mouse" the shackle pin.